Lupin III is the grandson of the famous French gentleman thief, Arsene Lupin. He and his friends, the master gunman Jigen and the master swordsman Goemon, go through many adventures to get treasures around the world. The beautiful and mysterious Fujiko could be either an ally or an enemy to Lupin, and Inspector Zenigata is always in hot pursuit of Lupin. Lupin III is a very popular animation series in Japan based on an equally-popular manga series by Monkey Punch. There are three TV series, five feature films, and numerous TV movies. 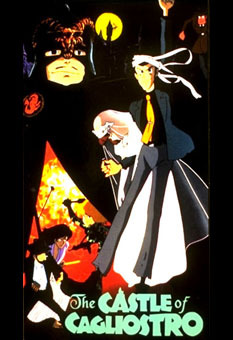 Miyazaki co-directed most of the first Lupin TV series with Takahata. In 1979, Miyazaki wrote and directed the second Lupin movie, Lupin III: The Castle of Cagliostro. In 1980, he wrote and directed two episodes of the second Lupin TV series: "Albatross - Wings of Death" and the last episode of the series, "Farewell Beloved Lupin".